Rollover crashes account for 2.5 percent of the total vehicle crashes in the United States each year. However, rollover crashes account for roughly 10,000 deaths according to the National Highway Traffic Safety Administration (NHTSA). To put this number in perspective, the NHTSA states that two-thirds of those deaths are a result of unbelted occupants thrown from the vehicle during a rollover. Yet, there is a potential to save a portion of the third of occupants who are not thrown from the vehicle with stronger roof structures. Stronger roofs are something that is already on the road. 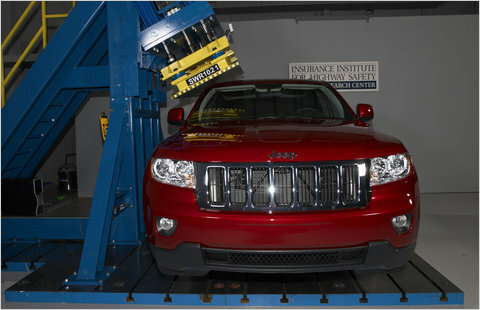 The new Insurance Institute for Highway Safety (IIHS) test for roof strength requires the roof to withstand 3.25 times the vehicle’s weight to achieve an acceptable rating. Far greater than the NHTSA’s 1.5 times requirement. This higher requirement has caused Auto manufacturers to strengthen the body structure in key areas where first responders commonly make cuts during an extrication. The 2010 Ford Edge was only Mid-Size SUV to get an Acceptable rating The 2010 Honda Accord Crosstour, Honda Pilot, Mazda CX-7, Mitsubishi Endeavor and Nissan Murano were rated Marginal. A bit of useful information is that none of the vehicles tested received a Poor rating. The fact that no vehicle tested received a poor rating means the roofs are stronger!